Labriola initially studied Hegelian philosophy at the University of Naples; in the 1870s and 1880s he was influenced by the school of thought of Herbart. Professor of moral philosophy and pedagogy at the University of Rome from 1873, in that period he was politically linked to the “historic right”, from which he would separate as he moved closer to radical and democratic opposition groups. In 1890, having corresponded with F. Engels, he began a systematic study of Marxist texts, of which he would become one of the greatest and most original scholars. 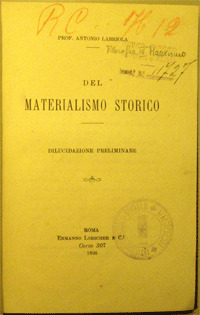 His Saggi sulla concezione materialistica della storia (In memoria del Manifesto dei comunisti, 1895; La concezione materialistica della storia: dilucidazione preliminare; Discorrendo di socialismo e di filosofia, 1897) have left a significant mark in Italian culture due to the influence they had on Croce and on Gramsci. Main works: Opere complete, a cura di L. Dal Pane, 3 vol., Milano, Feltrinelli 1959-1962; Scritti filosofici e politici, a cura di F. Sbarberi, Torino, Einaudi 1976; Saggi sul materialismo storico, a cura di V. Gerratana e A. Guerra, Roma, Editori Riuniti 1977; Discorrendo di socialismo e di filosofia, a cura di N. D'Antuono, Bologna, Millenium 2006; Carteggio, 5 vol., a cura di S. Miccolis, Napoli, Bibliopolis 2000-2006. Bibliography: L. Dal Pane, Antonio Labriola nella politica e nella cultura italiana, Torino, Einaudi 1975; S. Poggi, Introduzione a Labriola, Roma-Bari, Laterza 1982; A. Burgio, Antonio Labriola nella storia e nella cultura della nuova Italia, Macerata, Quodlibet 2005; S. Miccolis, Labriola, Antonio, in Dizionario biografico degli italiani, vol. 62 (2004); A. Burgio, Labriola, Antonio, in Il Contributo italiano alla storia del Pensiero - Filosofia (2012). Luigi Dal Pane, researcher and biographer of Labriola, reconstructs the history of the library which Labriola himself claimed was the second largest private collection, for extensiveness, in Rome (A. Labriola, Carteggio, III. 1890-1895, ed. S. Miccolis, Napoli, Bibliopolis 2003, p. 279): «Labriola’s library, when I first saw it in 1922, had already been divided into two parts: the largest part had remained in Rome with Labriola’s widow and daughter Teresa, the other part, which included the books of economy, had been moved to Bern by Labriola’s son Francesco Alberto. The part in Rome included the works of philosophy, most of the works about socialism and those about the French Revolution. The quantity of books was impressive, even if in very bad condition. I purchased the works on economy, those on socialism and on the French Revolution. The rest were lost» (L. Dal Pane, Antonio Labriola nella politica e nella cultura italiana, Torino, Einaudi 1975, p. 252). An indirect indication of the extent and – in part – of the rarity of Antonio Labriola’s library is the presence within it, documented by A. Zanardo (Antonio Labriola e la scuola teologico-evangelica di Tubinga, «Giornale critico della filosofia italiana», LXXXVIII, 2009, pp. 41-126), of several German theological journals: from the 1870s Labriola held the series of «Theologische Jahrbücher» of Eduard Zeller and Ferdinand Baur (1842-1857) and the annual volumes of the «Zeitschrift für wissenschaftliche Theologie» of Adolf Hilgenfeld (up to 1874), two of the main organs of the ‘Tübingen School’. He donated them to the National Library of Rome in 1887. The typed catalogue, on which is written “A part of the original library of Antonio Labriola” and which can be found among the “Carte Labriola” of the Società Napoletana di Storia Patria (which has given permission for its reproduction) was certainly drawn up by Dal Pane at the moment of purchasing the volumes which remained in Bern after the death of Alberto Franz Labriola in 1938: the price is often indicated. The catalogue, as Dal Pane explained, contains mainly works of history, economy and sociology; works printed after 1904 were certainly personal volumes of Alberto Franz Labriola. Although the purely philosophical part of the collection has been lost, the catalogue represents an important document, since it is the greatest evidence of a portion of Labriola’s library. In fact the historical, economic and sociological literature is particularly useful for reconstructing the final period of the activity of the philosopher, after he embraced Marxism, as the courses of the philosophy of history he held at the University of Rome from 1887 to 1903 indicate. 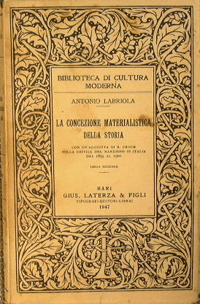 Main works: A. Labriola, La politica italiana nel 1871-1872. Corrispondenze alle «Basler Nachrichten», a cura di S. Miccolis, Napoli, Bibliopolis 1998; A. Labriola, Carteggio, a cura di S. Miccolis, 5 vol., Napoli, Bibliopolis 2000-2006; A. Labriola, L’università e la libertà della scienza, a cura di S. Miccolis, Torino, Aragno 2007; A. Labriola, Giordano Bruno. 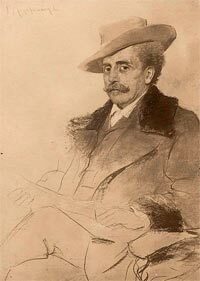 Scritti editi ed inediti (1888-1900), a cura di S. Miccolis e A. Savorelli, Napoli, Bibliopolis 2008; Quaderni per l'edizione nazionale delle opere di Antonio Labriola, vol. II, a cura di A. Savorelli e Stefania Miccolis, Napoli, Bibliopolis 2010; S. Miccolis, Saggi per una biografia Politica, a cura di A. Savorelli e Stefania Miccolis (con una bibliografia degli scritti), Milano, Unicopli 2010; “Edizione nazionale delle Opere di Antonio Labriola”, XI, Antonio Labriola da un secolo all’altro 1897-1903, a cura di S. Miccolis e A. Savorelli, Napoli, Bibliopolis 2012.